Posted by Ada Wang on 11/29/2018 11:51:17 AM. When asked about how to read EPUB on Kindle, probably the most often recommended method is to convert EPUB to Kindle format (such as Mobi), and the tool suggested is using Calibre, or some online eBook converter sites. However, even if you use these tools to convert EPUB to Kindle, you may see tips like "Sorry you cannot convert this file because of the DRM problem". It says that your EPUB files are protected with DRM. So at this time our problem is not just to convert format, but also remove DRM first. This guide is about how to convert DRM protected EPUB to Kindle. Hope it could resolve your problems perfectly. You know EPUB is one of the most common eBook formats. It's a free and open eBook standard format in eBook world. So you may find that if you purchased some books from bookstore like Google Play, rakuten Kobo, Nook, most of those files are in EPUB format. But the problem is that after you downloaded these EPUB to your computer, transfer them to your Kindle devices, you find you can't open them. This is because Kindle doesn't support EPUB format. Above I have told you the reasons why we need to convert, so this part let's talk about how to settle with. Since EPUB are protected with DRM, so we need to remove DRM from EPUB first. And Kindle doesn't support EPUB format, so after removing DRM from EPUB books, we need to convert EPUB to Mobi which is the most common format of Kindle books. Here I introduce this tool Ultimate Converter for you, as it's the best DRM Removal + eBook Converter. With this all-in-one software, we can solve both eBook format and DRM problem. You can download it for free trial. Get this tool started on your computer (Win or Mac). Usually if your books are saved in the default folder, this program will detect and upload them automatically. You can see them under icon "ADE" or "Nook". If not, you can just click "Add" button to add your EPUB books to this software. As soon as they are added, DRM are removed quickly. You can see the word "decrypted", it shows DRM has been removed successfully. Most EPUB books, such as Kobo or Sony, are protected with Adobe DRM. For successful DRM removing, you'd better make sure that you can read your EPUB on Adobe Digital Editions. And for Nook EPUB books, some of them are with Nook DRM, you need sync your Nook files with Nook for PC / Mac. 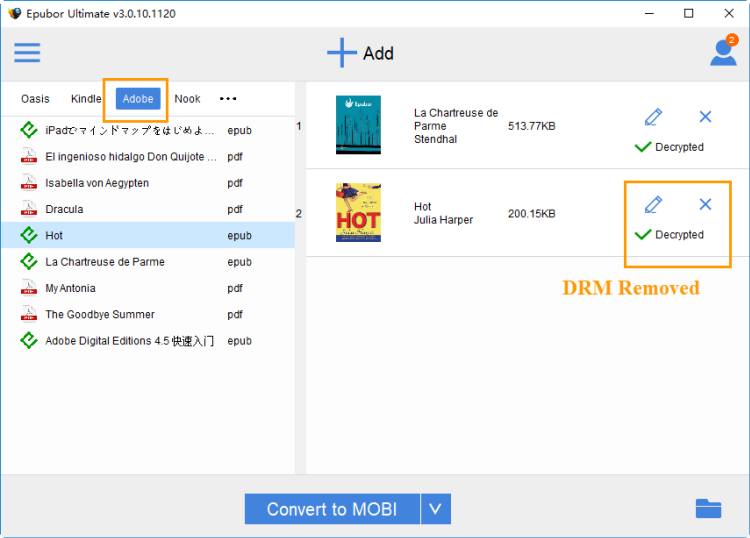 For details please visit how to remove DRM from EPUB. 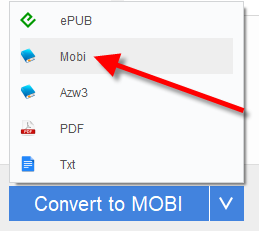 Select common Mobi as the output format, then click "Convert to MOBI" button to start conversion. The conversion will be soon completed. From the pop-up window you can get your decrypted Mobi files. No need to find converted Mobi file by yourself. Want to read them on your Kindle eReader? So easy, just connect your Kindle to computer with USB, and then copy them to your Kindle “Documents” folder. It's really a good joy to read your DRM EPUB books with e-ink Kindle eReader, yes? Why does it convert only the 20% of the ebook? The trial version only allows users to convert 20% of each book. If you want to convert the whole book, please buy the license for the software.